I am writing to increase awareness around the development plans at Fleming Place in downtown Peterborough. Fleming Place is a charming laneway lined with homes built in the early 1900s and equally old and historical trees. Preparation for a development which includes the construction of a new apartment building in the open green space is already underway. The plans includes the removal of the majority of these beautiful trees and an entire re-landscaping of the property. In my humble opinion, Fleming Place is a gem—an urban oasis—the likes of which I have never seen anywhere else. Anyone who has ever lived or visited there (particularly in the summer) can attest to this. It feels like you have walked into an urban forest even though you are in fact directly downtown. The trees provide an incredible amount of shade, cool breeze, habitat and a living example of our community's history. There are several gorgeous perennial beds on the property that have been built, cared for and maintained for my tenants. These are likely to go along with the trees. Mass cutting of trees has already occurred, and much more is to come. I encourage people to come and wander down the laneway and enjoy it while you can. The removal of all these trees is an irreversibly devastating decision. Trees and green spaces are part of the new plan, but a century of growth cannot be replaced. 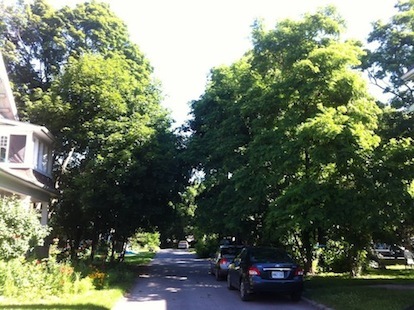 It is not likely that anything can be done to stop a development plan already underway, but expressing how important you think neighbourhoods like Fleming Place and urban trees are to our community and collective quality of life can't hurt!